... 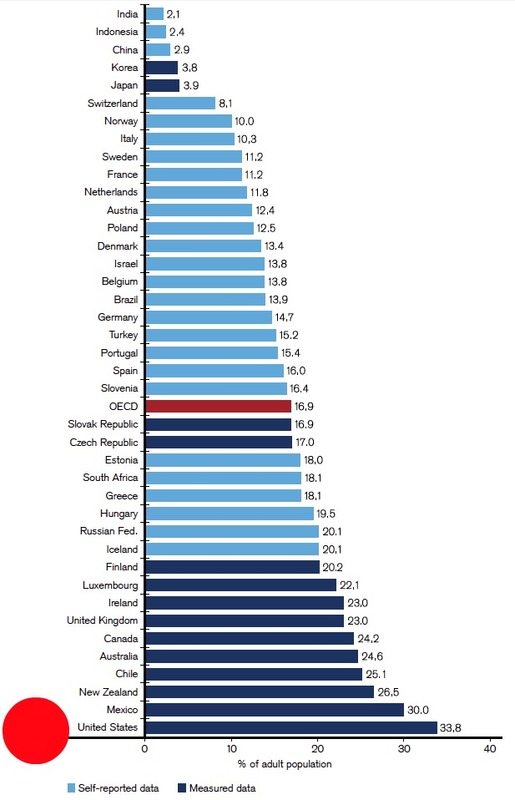 Charts like these paint a correlation that seems to be changing the world. Mexico, for example, is second in the world in adult obesity, first in type II diabetes (the leading cause of death in the country), and fourth in infant obesity. 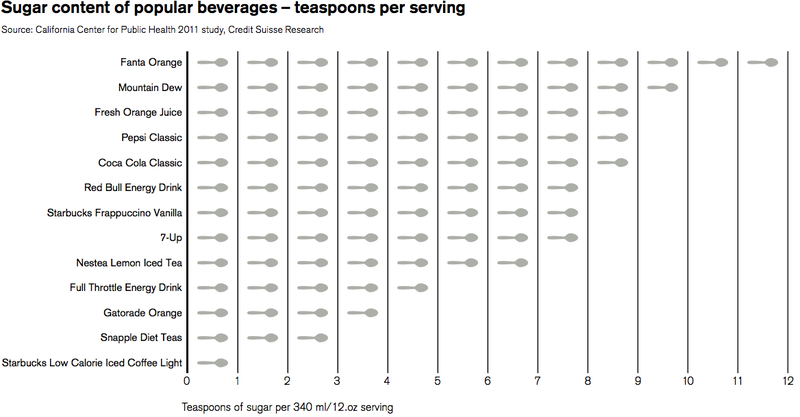 It's also second in added sugar consumption per person, and second in soft drinks consumed per person. 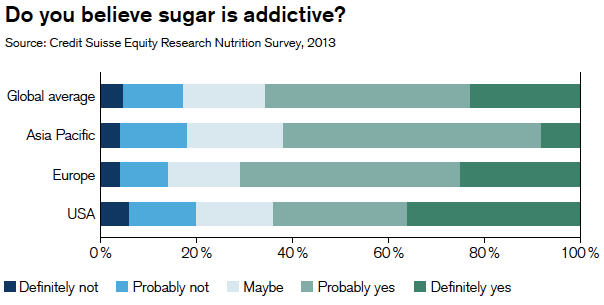 These illustrations come from a report out this month from the Zurich-based Credit Suisse Research Institute, titled "Sugar Consumption at a Crossroads." In it, researchers start with the basics of nutrition science and question common understanding along the way, and propose their most rational solution. Fructose and glucose are essentially same. Fructose, also called fruit sugar, is one of three monosaccharides (along with glucose and galactose) that are absorbed during digestion. Fructose is mainly ingested in one of two forms, either sucrose (table sugar) or high-fructose corn syrup (also called high-fructose maize syrup, glucose fructose syrup or glucose/fructose). Sucrose consists of equal parts fructose and glucose. High-fructose corn syrup (HFCS), on the other hand, usually has 55 percent fructose and 42 percent glucose (in HFCS 55) or 42 percent fructose and 53 percent glucose (in HFCS 42). 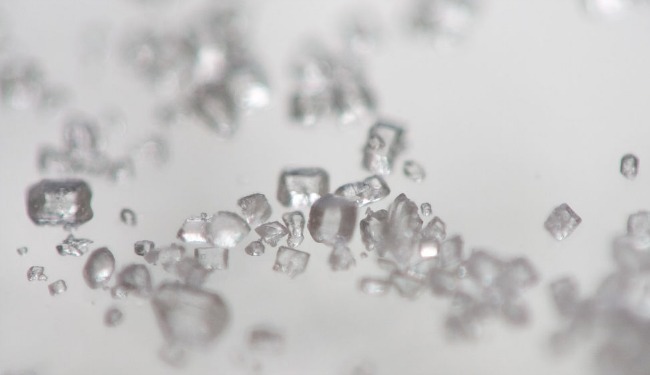 HFCS does have some important commercial advantages over table sugar, and is considerably cheaper, meaning it is now regularly used as the main sweetener in beverages. The temporal relationship between an increase in HFCS consumption (especially in sweetened beverages) and the increase in obesity has also elevated the focus on the potentially unique role that fructose may play in weight gain. 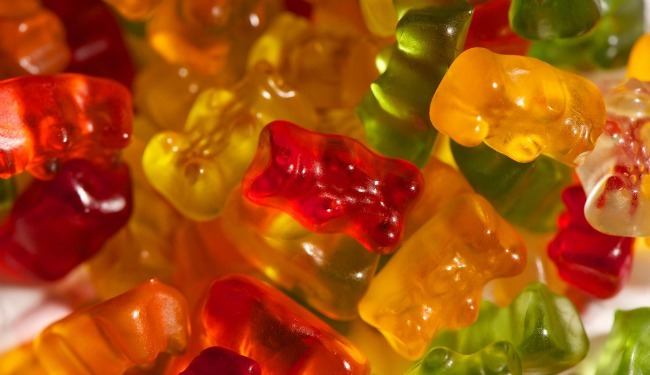 There have been a number of studies looking for differences in how the body metabolizes fructose compared to glucose. Unfortunately, many have been very short-term or carried out at levels much higher than the concentrations at which either nutrient is typically ingested. In addition, it is rare for either substance to be consumed in isolation in the human diet. Our review of the latest literature and our conversations with experts in the field lead us to believe that, in general, the biological impact of fructose is essentially identical to that of glucose at the concentrations at which these nutrients are generally consumed. The American Medical Association has weighed in on the debate and concluded that it does not believe there to be any difference between HFCS and sucrose when it comes to causing or aggravating conditions such as obesity or diabetes type II. Research has yet to conclusively prove that sugar is the leading cause of obesity and diabetes type II but the balance of medical research is coalescing around this conclusion. 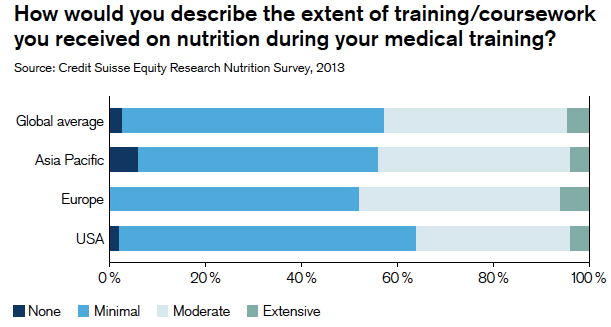 A proprietary survey of general practitioners showed that close to 90 percent support that understanding. In addition, there is not a single study showing that added sugar is good for you, which would be expected if the impact of sugar or HFCS was truly neutral. 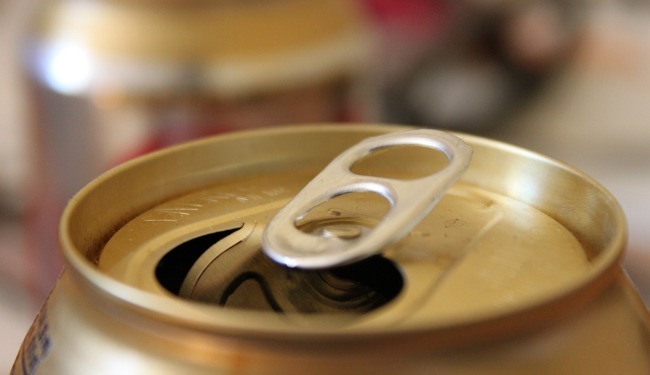 The correlation between obesity and soda consumption across many populations is convincing, and is a particular risk factor for childhood obesity. Genetic variations in insulin response are an important factor and allow some people to tolerate more sugar than others. Liquid and solid “sugar calories” are handled differently by the body. As the sugar in soda is in a solution, it is easily and completely ingested, giving a large injection of calories without the consequential satiation of appetite. 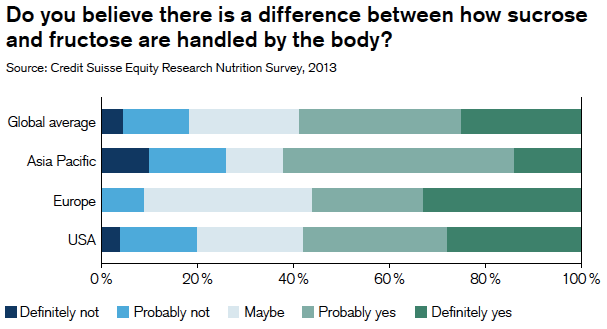 Obesity, as bad as it is, is not the most worrisome issue. Diabetes type II is now affecting close to 370 million people worldwide, with one in ten U.S. adults affected by it. The costs to the global healthcare system are a staggering $470 billion according to the most recent estimates from the International Diabetes Federation, and represent over 10 percent of all healthcare costs. In the USA alone, the healthcare costs tied to diabetes type II are estimated at $140 billion, compared to $90 billion for tobacco-related healthcare costs. Even more worrisome is that these numbers are growing at a rate of 4 percent a year, much faster than for obesity (1 to 2 percent). ... Local and national authorities around the globe are beginning to take action, with varying degrees of success. Interventions include anti-soda advertising campaigns, tax levies, removal of vending machines in schools and regulation of portion size. However, as Mayor Bloomberg discovered in New York, when his attempt to limit cup sizes was defeated in court, the combined lobby of the sugar industry – which is a huge employer and therefore has significant voting power and that of the food and beverage manufacturers – makes things much more difficult. After balancing arguments in favor and against, we believe that taxation would be the best approach and will provide the best outcome: reducing consumption while helping the public sector deal with the growing social and medical costs. Against growing negative public opinion and the threat of regulation or taxation, the food and beverage industry is beginning to take steps toward “self-regulation” and pro-active media campaigns. The beverage industry has also for some time recognized the need to diversify into healthier products, including fruit juices, sports drinks, bottled water and diet soda. However, many of these products are also coming under scrutiny; either as sugar in a healthier guise (fruit juices) or for the inferred disadvantages of artificial sweeteners – particularly Aspartame, whose application was rejected six times by the Food and Drug Administration (FDA). 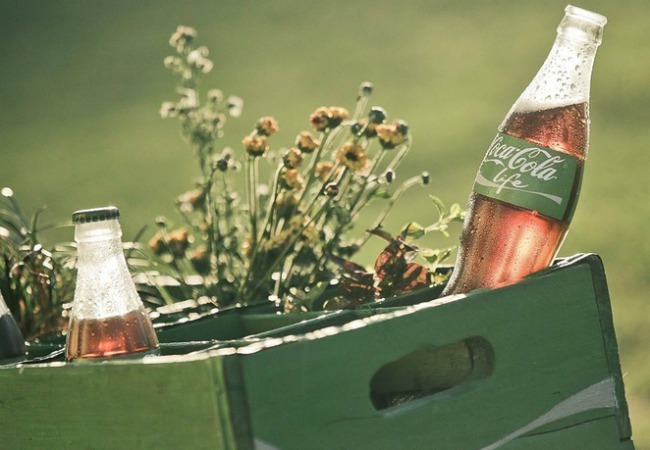 The experiment of Coca-Cola Life in Argentina (sweetened with half Stevia and half sugar leading to a 50% reduction in calories) is an example of what we expect to see over the next few years. We believe that the “noise” on sugar and its effects on our health will increase rather than decrease. Even well regarded and independent bodies like the World Health Organization (WHO) have to catch up. In all its reports on diabetes, the WHO barely mentions sugar as either a cause or as part of the treatment (i.e. reducing sugar intake). 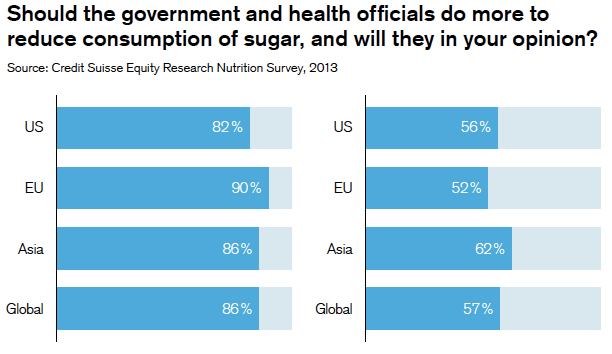 So the most likely outcome over the next five to ten years will be a significant reduction in sugar consumption and a marked increase in the role played by high-intensity natural sweeteners in food and beverages. Soft drink consumption might suffer somewhat in the short term, as it will take some time for companies to successfully establish a new line of “healthier” alternatives. So these economists say taxation is the best idea, but since it's difficult to pass legislation, market-driven self-regulation (born of savvy consumers and threats of taxation) is likely what we'll see. 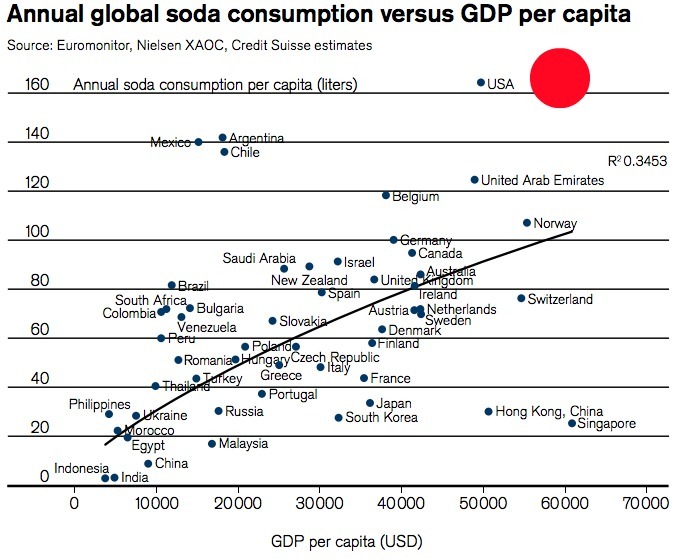 That's why these kinds of charts and stats are valuable, in everyone being aware of the scope and nature of these epidemics, and to keep thinking about the changing role of sugar across bodies and cultures.